I had a vague recolection of eating this cake once as a kid. It had popped back in my mind and the kitchen wasn’t going to be a happy place until I knocked one off. Boy am I glad I did. So easy, and quite, quite tasty. The yogurt in it keeps it lovely and moist, letting the cake still taste just as good about 5 days later, and the nuts give it a bit of texture. It does puff up quite a bit with the bicarbonate soda in it, so don’t as I did, open the door and to peak inside, as it will deflate a little. Also where ever you are, change the nuts on top to what’s local to you. I’m sure a lot of different kinds will taste just as delicious. mix it all together, until it looks like fine bread crumbs. Halve it. Placing one half in a greased and lined tin (approx 23cm- I used a springform), press it down firmly. decorate with whatever nuts are in your area, I used macadamias. Bake at 180C for approximately 50 minutes. 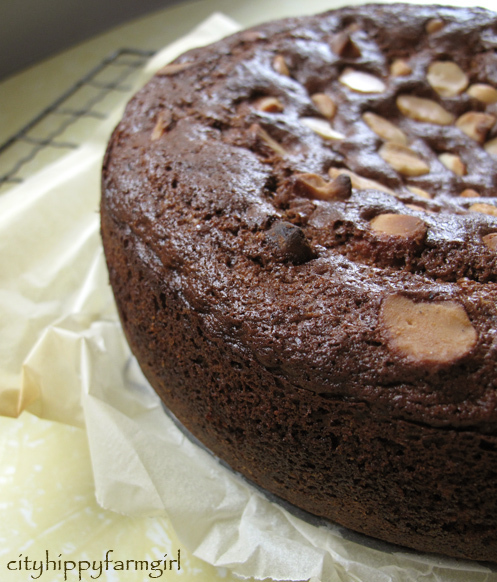 This entry was posted in Food Glorious Food and tagged armenian nutmeg cake, easy cakes, food, macadamias, nutmeg, recipes, spiced cake by cityhippyfarmgirl. Bookmark the permalink. I love spicy cakes like this, especially with a cup of tea. So much better! I love the smell of it….and grating it with it’s little tiny grater. Another great recipe – thanks. It looks delicious! I love a good spice cake. I’ve even got whole nutmeg in my pantry. It’s fate… I have to make it. I’ll let you know how I go & I’ll try my hardest not to peek halfway. Oh it must be fate. Let me know if you do it. It’s definitely my favourite cake at the moment. Yum! I’ll try this! I always have gingerbread or spice cake around the place. So good with a cup of tea! Mmm gingerbread….maybe that’s what I should make today. I am quietly loving cakes made with yogurt. It gives it that extra special oomph. I’d be quite a happy girl with a slice of this spicy, nutty cake in one hand and an organic, fairtrade coffee in the other. Yogurt in cakes is great isn’t it. I think I would be a little lost without the natural yogurt, I seem to whack it into everything at the moment. That looks AMAZING! Thank goodness I don’t have to go to work tomorrow because I need to make this. I knew I bought yoghurt for a reason today. Thanks for sharing. Yes indeed. The pulling power of the cake… I understand! MMmmm! This looks like tomorrow’s breakfast! 190- is that a medium oven? According to my little converter Heidi it’s 374F. So if that’s right, a tad hotter than a moderate one. I’ve never heard of this cake, but it sounds marvelous. Time to get some fresh nutmeg! I’m a happy girl just smelling the freshly grated nutmeg. Where would we be without spices huh! I know enough about baking to know that sugar plays a big role in creating texture and character – but this delicious looking baby has just a bit more sugar than I’d like – what do you think about halving the sugar? What might be the result? Oh, what the hay, I’m going try it anyway. Dr it is a bucket load of sugar in this one I admit. I usually try and tone down the sugar a bit but didn’t with this one. I think it would work, but I would maybe make sure the sugar was a dark one that has a bit more flavour to it…like a muscavado or something like it. No nutmeg….hmmm, Armenian Ginger Cake? Lucky you, for getting to hang out at Salamanca Markets, and trying their cheese! This post came at a perfect time as I was looking for something else to do beside go for an early morning run!! I added ground ginger and mixed spice, reduced the sugar and added a little more yoghurt and then topped it with crushed almonds – delicious it was too! Thanks for the inspiration (and distraction)…though it did mean that at 1030 this morn we sat down to cake, ice cream and coffee. This sounds yummie I might try it, I love a little spice in cakes, reminds me of Goodie Ol Grumpeties cake. I’ve never liked eggplant but your curry might just make me like it and we have the best coconut straight from our trees. This link has amazing photos of bubbles if you wish to see, you will have to click on the bubbles option. My best friend used to make this cake quite often. Only she made it with ground nutmeg. I can only imagine that freshly grated nutmeg would really enhance the smell, taste and flavour of this cake. 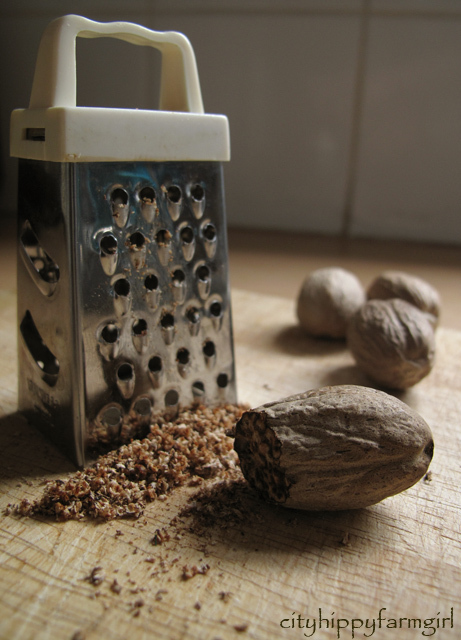 I love using freshly grated nutmeg these days. Your cake looks very moorish.